Los Angeles, California, is the second-most populated metropolitan area of the United States. The Los Angeles International Airport is the primary airport serving the area. It is commonly addressed with its airport code LAX, with the letters usually pronounced individually. LAX is located in southwestern Los Angeles in the neighborhood of Westchester, 16 miles (26 km) from the downtown core. There are six central car parks which offer long and short-term parking. They are connected to the terminals by the LAX shuttle bus. The free shuttle bus service runs to the Metro Rail Green Line Aviation Station from the lower level of each terminal. Another shuttle connects to the Bus Center, from where city buses serve the whole of the Los Angeles area. Prime Time Shuttle and Super Shuttle are both shared-ride van services but prior reservations are recommended. Some hotels also offer transport. Taxis are also available from the Arrivals level: the standard rate to downtown Los Angeles is around $35. Central Terminal Parking is available at Terminals 1, 2, 2A, 3, 4, 5, 6 and 7. These structures are primarily intended for drop-offs and pick-ups. But it is an expensive alternative for daily parking. You have to follow the signs to get to these lots as you approach the airport. There are two economy parking lots. Parking is free for the first two hours in these lots to draw more people towards these kinds. The charge for each additional two hours is $1 and a 24 hour booking costs $8 for Lot B and $10 for Lot C.
Shuttle B (for Lot B) and C (for Lot C) bus stops are located on the lower (Arrivals) level of all terminals. Lot B is at 111th Street and La Cienega Boulevard. 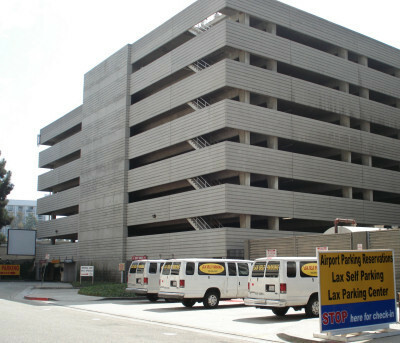 Free LAX Shuttle Bus marked 'B Airport Parking - 111th Street' serves between LAX Airport Terminals and Parking Lot B. Lot C is at 96th Street and Sepulveda Boulevard. Free LAX Shuttle Bus marked 'C Airport Parking - 96th Street' serves between LAX Airport Terminals and Parking Lot C.
Shuttle buses connect the Economy parking with all the terminals. Shuttles run every 15 minutes or so, all through the day. A large number of long-term parking lots surrounding the airport are available. These include private companies' lots and LAX's Parking Lot C and Parking Lot B. They are all networked through free and frequent shuttle service to each terminal building. Some of the private companies offering parking lots have covered parking facilities and other value added services as well.